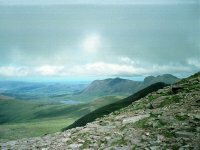 Ther pictures on this gallery are not mine but were taken by my walking companion Graham Jackson. 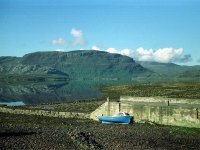 We were spending a week in the Highlands in June 1991, and we'd booked into a B&B in the tiny village of Inveralligin on the north side of Loch Torridon. On the first day of the trip my trusty Practika LTL100 camera, which had given stirling service since 1979, jammed irrevocably. I was also going down with a stinker of a cold at the time so it wasn't a particularly lucky week for me. 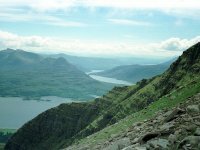 We did three major walks during the week, of which the highlight was this one, the ascent of Beinn Alligin (the Jewel Mountain), elevation 3235 ft. It was a memorable day out among spectacular scenery, and Graham has kindly agreed to let me publish his pictures on the site. Uniquely in these galleries, you will actually see me in some of the pictures. The sheer beauty of Loch Torridon, seen from our B&B in Inveralligin at breakfast time. 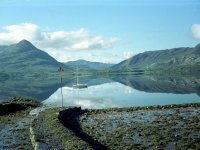 A truly tranquil scene, the surface of the loch is so still that it's almost acting as a mirror. Looking across to Shieldaig once more. 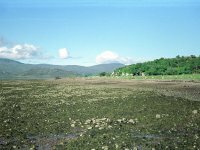 The foreshore of Loch Torridon. 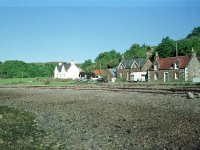 Part of the tiny village of Inveralligin. Looking across the loch from the driveway of our B&B. After breakfast we drove the short distance to the east, to leave the car at a car park at the foot of the Coire Mhic Nobuil, just above Torridon house. Just upstream from the bridge is this splendid little waterfall. It's probably a couple of hours later. 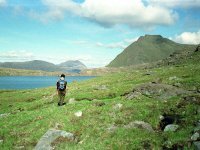 We've walked through a strip of forest to emerge into the upper glen, a wild place sandwiched between Beinn Alligin to the northwest and Liathach to the southeast. 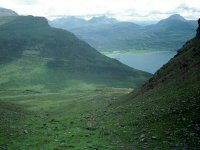 We've then left the main path through the glen for another path leading into the Coir nan Laogh, the first of the two great corries in Alligin's east face. 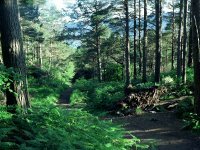 The terrain is very marshy at first but improves as the path gains height. We're quite a way up into the corrie. As you can see, the weather didn't maintain its early promise but the cloud cover is still light and we don't think there's any threat of rain. The corrie curves gracefully - but steeply - around to the right. I really felt this ascent, in fact it remains the most punishing I've ever undertaken. I didn't know it at the time but I was going down with a heavy cold, which probably explains why I felt the effort so much. 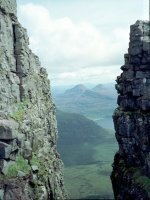 We're high into Coire nan Laogh here and seeing the celebrated bedding planes of Torridonian sandstone close up. Unsurprisingly we were not alone on the walk. Due to my restricted pace most other walkers overtook us easily. I actually lost sight of Graham for ten minutes or so but I knew he wasn't far above me. We're looking out across the mouth of the corrie here and seeing Upper Loch Torridon laid out before us, with Beinn Damh (to the right) and Beinn na h-Eaglaise (to the left) oppisite. Some low cloud scuds across as we approach the saddle at the top of the corrie. The top of the corrie and our first view beyond. 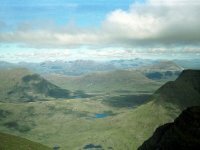 That's Baosbheinn over there, and to its left is the wild, lonely country of Sheildaig Forest and a hint of the coastal village of Gairloch. It's now just a short climb up to the right to gain Tom na Gruagaich, Beinn Alligin's south top. Six years after our ascent Gruagaich was promoted to Munro status. A look back at the way we came up. The peaks on the south side of Loch Torridon are still just visible but that cloud is scudding in from the west. We're at the top of Tom na Gruagaich, looking due north. 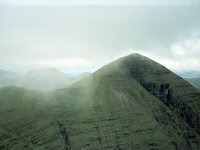 The main ridge of Alligin is clearly seen, with the ridge path climbing up towards Sgurr Mor via an intermediary, un-named top. 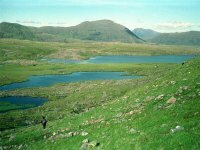 Out to the north Loch Ghobhainn nestles at the foot of Baosbheinn, while Loch Gairloch opens to the left. 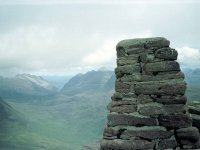 One of the most arresting sights in the Scottish Highlands - the sheer walls of Toll a Mhadaidh Mhor, the great corrie on the southeast side of Beinn Alligin. Sgurr Mor, Alligin's principal summit, fills the shot to the right and the great cleft of the Eag Dubh is obvious. 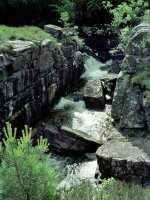 It's said that Britain's last wolf was shot in this corrie, late in the eighteenth century. 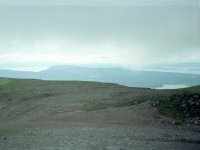 From the same spot, Graham tracks the camera down and to the right for a shot of Na Rathanan, the Horns of Alligin. 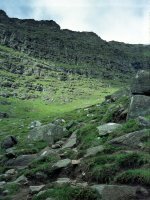 This is a route often described in guidebooks as "exciting" or "challenging", a sure warning to faint-hearted hillwalkers like me that it's a place to be avoided. 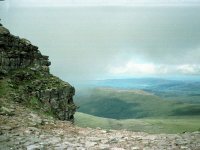 In fact the general consensus sems to be that the Horns exhibit roughly the same standard of difficulty as Striding Edge on Helvellyn. Further to the right again we're looking down the length of the wild glen to the rear of Liathach. The heel of the Horns is closest to us on the far left. 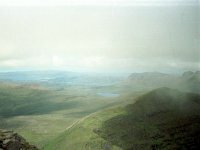 with the dark blade of Beinn Dearg next along, about two miles away. 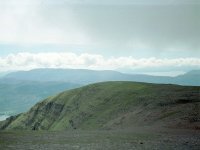 Beinn Dearg ("Red Mountain") just fails to reach the magic figure of 3000 ft high. 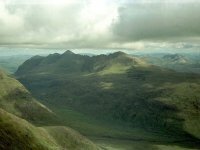 Beyond Beinn Dearg, in the centre of shot, is the sandstone / quartzite magnificence of Beinn Eighe. 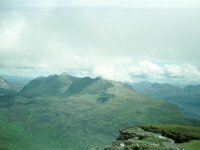 Liathach is coming into view on the right. 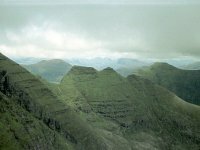 A fifth panorama shot from Tom na Gruagaich shows Liathach in all its terrible splendour. 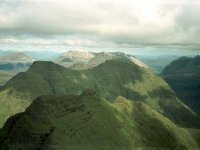 Liathach is a mountaineers' mountain, a peak that inspires awe, possibly the most magnificent hill in Britain. 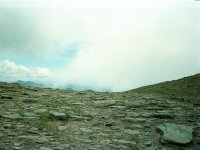 The principal summit of Spidean a Choire Leith is well seen, together with the chaotic sandstone cliffs on its north side. 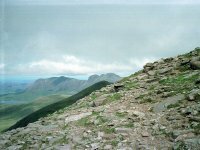 Liathach's ridge walk is commonly regarded as the most difficult on the UK mainland. You'll not be getting me up that one. Tom na Gruagaich's summit trig pillar. Curiously, there's no trig pillar on Sgurr Mor. 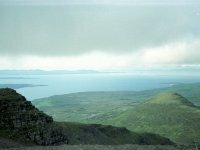 A look out to the west; that's Loch Torridon out there, with the northern tip of the Isle of Skye beyond. The pimple-shaped hill a couple of miles away is An Ruadh-mheallan. A view a little to the south of the previos shot, in which we see the northern tip of the Applecross peninsula above Tom na Gruagaich's east top. 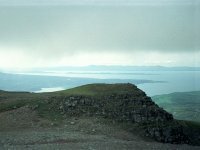 Skye is in the distance, with the isle of Rona between it and Applecross. 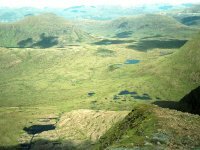 We had lunch on the top of Tom na Gruagaich and it's relatively late, getting on for 2pm, as we set off on the ridge walk to Sgurr Mor. 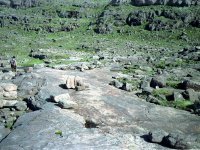 Initially the terrain is benign, though very stony. We cast a look back at the way we came. 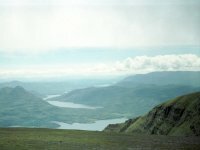 And, from the same spot, a view across Upper Loch Torridon to the south, with Loch Damh seen beyond. Graham put the camera away for the next hour as we made our way along the ridge to Sgur Mor. 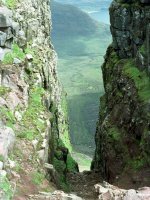 It becomes narrower and rough, and one is continually distracted by the awesome cliffs of the Toll a Mhadaidh Mhor a few feet to the right. On the way down to the col there is one awkward obstacle, a rockstep of several feet that makes many think twice, but with care it can be bypassed a little way to the left. The slopes are steep on this side but nothing like as sheer as those to the right. It's quite a climb again from the col, and we took a path bypassing the un-named middle summit. From the second col there's a steep climb of about 500 feet to the top of Sgurr Mor and I seriously considered leaving my rucksack there to cut down the effort. It was just on 3pm when we arrived here - the top of the magnificent vertical gash of Eag Dubh. Eag Dubh fairly takes your breath away. It goes straight down for 2000 feet. Even the top of it needs two portrait shots to capture, the scale is just too big to get it into one picture. It was ten past three when we arrived at Sgurr Mor, the principal summit of Beinn Alligin. It was Graham's first Munro, and my third. 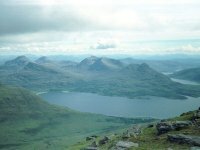 A magnificent view over Upper Loch Torridon was our first reward. 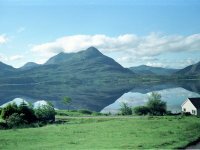 An awesome view of Liathach, now free of cloud and seen in its magnificent entirety. What could be better than this? 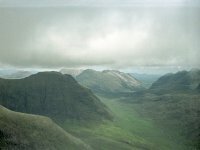 Torridon laid bare - the Horns of Alligin, backed by Beinn Dearg, backed by Beinn Eighe. One of the finest views in Scotland. 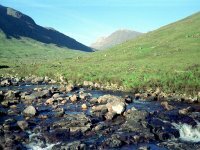 The magnificent wilderness of the Flowerdale forest to the north of Beinn Dearg. 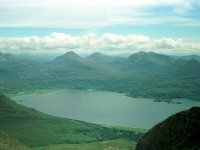 Beiin an Eoin is about five miles away, and beyond it across the unseen Loch Maree is Slioch. I could easily over-use the word "magnificent" here but what else does justice to this scene? 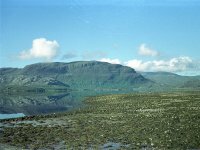 The wild northern hinterland of Beinn Alligin is seen here, with Loch Toll nam Biast in the foreground and Loch a Bhealaich (at the foot of Baosbheinn, out of shot) to the rear. The unspoiled emptiness of the Flowerdale forest to the rear of Beinn Dearg. After spending some thirty minutes at the top of Beinn Alligin we felt that time was pressing. We returned the way we'd come, down to the first col, then descended the long, grassy slopes to the west. We were aiming to go round the Horns to the rear. We're a thousand feet lower down here, and approaching Loch Toll nam Biast and its nameless neighbour. The terrain had looked a bit scary from up above. What were we letting ourselves in for? About the only time you'll ever see me in these galleries. We're making our way along the south shore of Loch Toll nam Biast and are pleasantly surprised by the benign nature of the terrain. This is proving to be a real adventure. What from above looked like it could be naked mud proved to be a huge pavement of bare Torridonian sandstone. Mindful of the packed contours at the eastern end of the Horms we're making sure to lose height as rapidly as the terrain will allow, but we're completely taken with this scene. Here is complete, true, wilderness - not a single trace of the hand of man can be seen. No buildings, no roads or tracks, no plantations, no fences or walls, no paths, no power lines, no footprints. Just pristine, empty country. And we have it all to ourselves. 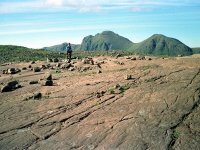 Baosbheinn, enjoying late afternoon sunshine as we make our way across another rock pavement. 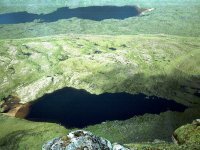 We made our way down the slopes by the outflow from Loch Toll nam Biast to arrive in the upper reaches of Bealach a Chomhla, between Beinn Alligin and Beinn Dearg. It was a fairly easy walk to the south, with traces of path here and there, before we picked up the well-used route coming off the foot of the Horns. From here the path descended beside the Allt a' Bhealach (stream of the pass) to cross the footbridge and join the main path along the Coire Mhic Nobuil. The sun was shining strongly and gave us this beautiful view along the glen towards Beinn Eighe. It was gone 7pm when we reached the forest again, with only a short distance to cover back to the car. It was a struggle to find somewhere still serving food at that time in the evening but eventually we found ourselves a bar meal at the Shieldaig Hotel. Sorry to use that word yet again, but we'd had a truly magnificent day.